Top international business schools meet executive talent through One-to-One meetings in Johannesburg on August 29th 2018. Over the past years the Master of Business Administration (MBA) has become highly valued degree across all industries and types of organisations. And rightfully so – it can be an asset for professionals who wish to give their managerial career a boost, be it in the corporate world or as entrepreneurs, as well as for those who are looking to switch to a different professional field or geographic region. MBA programmes taught in English are delivered in diverse formats to reflect the variety of career development approaches and learning styles – full-time one- or two-year programmes, part-time, executive, online, modular, weekend, and blended. Even with increased opportunities for studying in all parts of the world, competition is not to be disregarded. Top business schools select ambitious and well-prepared MBA candidates to build diversity in the classrooms, where peer learning is of high value, and to maintain strong alumni networks. Professionals aspiring to MBA studies need to be committed and driven during the school selection and application process in order to have a worthwhile MBA experience at the business school that will best develop their potential and career. Deciding to do an MBA is a matter for career, lifestyle, and future development. The character and approach of a school are important factors for MBA candidates to consider. How different MBA programmes match one’s expectations is easily discernible by speaking with their representatives in person. One-to-One MBA event participants get a sneak preview of their chances for admission by asking the right questions and putting forward their best presentation skills. 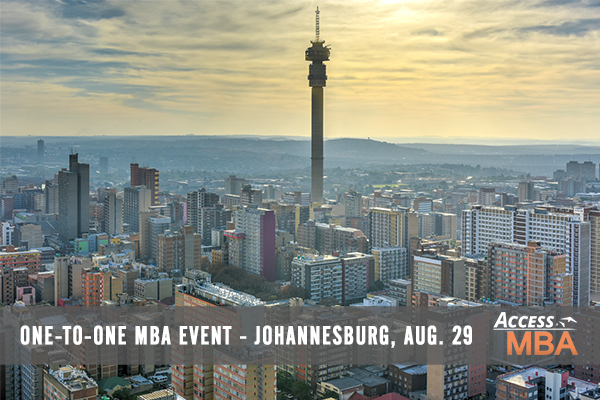 Among the top-ranked, and thus most competitive, business schools participating in the Johannesburg Access MBA event on August 29th, 2018 are MIP Politecnico di Milano, IE Business School, Cass Business School, University of Cambridge - Judge Business School, Hult International Business School and many more. · Studying for an MBA can help you not only learn valuable business skills, but also network with knowledgeable and successful professionals in the industry. Registration: Online registration is free of charge. By registering at least 10 days before the MBA event, event participants will receive a profile evaluation and a personalised consultation to identify the most suitable business schools at the event!